I first met Ana Pacheco in 1999. I had been visiting Monika Kinley and noticed on her wall a painting of an orange rubber glove. I was told it was by Ana and that it had been returned by the man who had bought it because his wife had disliked it. I wondered that a man would be so feeble over his choice of art and why he didn’t hang the picture in his study where it would not offend his wife. I wished that I could own the painting. Monika took me to meet Ana in her studio at the National Gallery. It was a scuffed white cube of a room, half below ground with the light filtering through from Trafalgar Square. Ana talked about how the collection had affected her and that, in particular, the gallery’s images of Saint Sebastian had inspired her work. 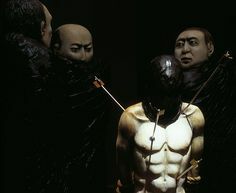 The sculpture resulting from her association with the gallery, The Dark Night of the Soul, is a work that goes beyond images; the intensity of the more than life-size figures and the imagined pain and horror of the hooded man at the centre of their gaze were so strong, they held the viewer in curiosity and shame. The subject matter of so many of the two-dimensional paintings in the gallery became a three-dimensional drama; pictures of agony and martyrdom and the involvement of the otherwise innocent. The involvement of the otherwise innocent being a leitmotif in this uncertain and intolerant age. It was the empathy between the Gallery, Ana and her work that enabled it to be shown in a way as telling and foreign as the work itself. I remember blood-red walls, all in darkness with spots shining down from the ceiling above an imprisoning square. The figures standing within it seemed unable to leave the spectacle they were watching, concentrating on; a hooded man tied to a post with ropes. We, the visitors, were able to walk onto the square and move among the figures. This unnerved me. Though more than life size, heavy and solid as the wood they were hewn from, they seemed in the semi-darkness to be alive. When I, as they did, looked intently at the hooded man, I became implicit in his suffering.